I do! I don't go to the Gym Though. I Just use my Iron Bar (Such a Gimmick BTW But it doe's help my motivation to get a light workout in everyday), My 5KG Dumb weight's and a Basic DCS (i lend it out if someone come's along with me to airsoft) complete with a US Canteen, 7 G&P Mid Cap's on it and my Sapi plate's filled with sand (I'm at the level where i needed more weight) 4 G&P Mid's in Various Pocket's on my leg's. So yea i have gone Massively overboard with it all but i see it as getting in shape for when my brace's are finally out so i can apply for the Force's and not be so monumentally Screwed straight away. I Usually have foam Plate's in my Carrier i lend out so whoever get's to use it isn't crumbling beneath the weight. so what do you guy's do to keep fit? Used to go to the gym, walk everywhere, play rugby and was a football ref. Just use my bike to get places now. I've got a load of home gym equipment, dumb bells you can set the weight of by adding/removing weight etc, also got a bench press thing with a weight adjustable bench-press-weighty-bar-thing, which is also good for leg exercises and sit-ups, plus a pull/chin-up bar and a cross trainer and I'm pretty sure everyone has floor space for press ups lol, combine all that with a very limited knowledge of muscles and you can build up some decent routines for yourself. I tend to do upper body work outs on a fairly regular basis when Uni seems to be getting the better of me, usually make them last between 30 and 45 minutes depending on the pace, depending on how much energy I've got lol. I think it's quite therapeutic, gives me a sense of satisfaction and it's good for passing the time when you're looking for a distraction from work, because you still feel like you're doing something positive without it being something people typically do to enjoy themselves. Whenever I've got work to do and can't be arsed, I feel guilty if I do something "fun" like go out, or play on the Xbox, so doing a work out fills the void quite well lol. I used to go on runs for a brief period a year or so back, which I think I'm going to start again once this bout of Uni work is over around mid-Jan. Just need to get myself some new running shoes. I realised at a skirmish yesterday that my cardio is horrifically shite lol, people actually commented on me having unusually heavy breathing. So yeah, when I used to go on runs, I got an app on my phone that tells you when to run or walk, it's supposed to slowly increase the run and reduce the walk sections until you can go a full 10k without stopping, it's a 13 week program so I think I'm start that again at some point. Other than that, I don't do anything really, I walk a lot though, having never passed my driving test and finding busses to be almost literal daylight robbery. I never liked the idea of joining a gym, I feel uncomfortable doing exercises around other people, I just think there's something weird about it. Then of course there's airsoft, which I think I probably get more out of than most people. No one else seems to carry about half as much as me lol. I attempted to walk the width of the country for charity a few years ago with some mates to mark the end of 6th form. We only made it about 40 miles before someone did they back in and another nearly broke their knee, me and the remainder deemed it dangerous to carry on with only 2 people so we had to call it off, but it was awesome fun, great experience. I'd love to try doing it again at some point. When you say width of the country, do you mean Lands End to say Great Yarmouth or do you mean Whitehaven to Sunderland? Lol I'd have said length of the country if I meant Lands End to Great Yarmouth. Anyway, it's generally measured to be between 190 and 210 miles, so 40 was pretty poor going haha, though we did manage 40 in 2 days, with 20kg bags full of camping equipment and stuff, so it wasn't bad going, considered we'd not done any training or anything. It was awesome fun, lots of stories from it. Looking to do it again at some point in the next few years. We also raised over £500 for Epilepsy Research UK, despite essentially failing to get anywhere. Isn't the start/finish (depending on which way your going) on the east coast Robin's Hood Bay? Or am i thinking of a different one? It might be Robin Hood's Bay to St. Bees Head then, I honestly can't remember lol. Both sound familiar though. well.. I do jogging.. not in stupid jogging clothes. rather in military clothes with water bottles in the pocket (not all of em full... yet) and a backpack packed with 2L bottles (again, not full yet)..
while at airsoft I got a bit tired of a heavy kit so hardly have anything more than my AEG & GBB, thou I run a lot so I think that makes up for it. In london I used to cycle *everywhere* until a car took me down at work.. might try cycling again and see if my back is better. I try to put aside atleast 45-60 mins a day. 20 mins low intensity cardio to warm up and build up the heart rate followed by a split routine workout, I try to alternate between high weight-low reps and low weights-high reps to keep it interesting. And on Tuesdays, Thursday and either Saturday OR Sunday, I'll get in around 30-45 mins cardio. Just going for a quick run around the village or nearby fields or going for a swim. It really helps with my endurance and cardio during airsoft skirmishes and makes me feel pretty good about myself. 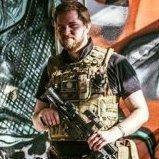 I Cycle everywhere I go,even to my local airsoft site.I also go Mountain biking for 4-5 hours every Sunday,and Hiking on Fridays.So that's something I guess.Every other day I just sit on my arse doing nothing. TBH I've never been a gym person, I'm more old school, If I want to go for a run I'll go outside rather than a tredmill. Also never underestimate the physical workout of chopping wood! The main way I stay in shape is sport, nothing special just basketball and rugby usually. Back in October when I used to go to the gym I would do 2 hours of almost pure cardio, burns off atleast a third or two of the daily calorie intake but apparently I lost weight. Stopped going because I nackered up my knee the day before my birthday then nackered up my foot then got completely swamped with college work. I did go to boxercise for a bit which is a mix between cardio and strength but due to the finishing times I found it difficult to get home so I had to stop going. I started going to the gym back in about Febuary/March and it lasted until April until I went up to Scotland for about a week and it completely threw me off track, I went on and off for the next few months until I stopped going then got motivated again at a Halloween party when I saw a girl I used to 'like' and I saw how much weight she lost, me and her were friends though. I want to start going to the gym again and £20 a month is decent enough but we get all the kids coming up and just hanging out on the machines or hogging certain ones and it's just really annoying and then college work is still there and the fact that I don't have a partner anymore is a bummer to the whole thing.